Having just visited Geneva by train, I have passed through Paris. There is much more to say about cycling and public transport in Geneva, which is very interesting, and less well-known to UK audiences, so more on that later, but for now some brief observations on Paris. When I first visited Paris in the early 1990s, there was little cycling there, comparable to London at the same time. Then came a certain amount of segregated infrastructure, mostly created with the aid of strips of rubber bumps in the road to semi-segregate the space, later came some better segregated tracks, and in 2001 the Velo scheme, which I saw the very beginnings of, at a time when something similar was first being mooted for London. 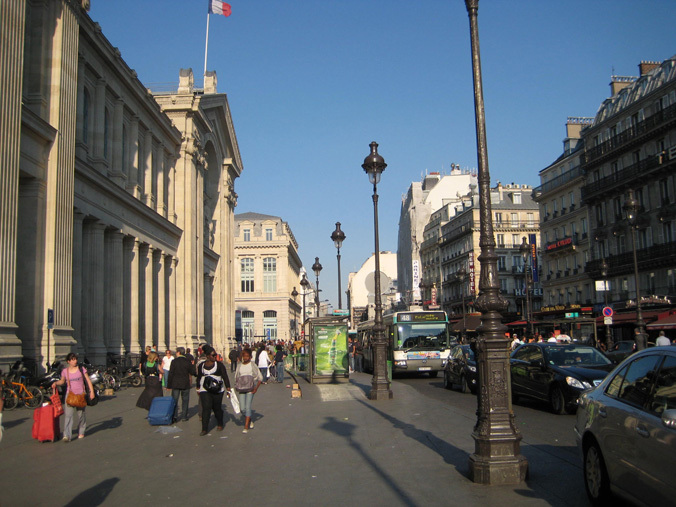 I noted at the time that the Paris hire stations had often been located to take advantage of the segregated tracks, of which there were far more than there were (or are) in London, and that this was a significant factor in their success as I observed it. Nobody else discussing the subject in the UK seemed to be aware of this factor. I more recently wondered whether the London scheme would succeed by comparison, both on the grounds of lack of infrastructure, and the demographic differences between central London and central Paris, central Paris being far more residential. It seems that my caution was too great, to the extent that the London hire scheme does seem to be succeeding to some extent on its own terms, though TfL are desperately talking it up all the time and not talking about the fact that it has never achieved the number of trips that was anticipated for it. I last visited Paris in 2009, and was struck buy the way cycling had taken off there, some years down the line from the commencement of the velos. This seemed to be despite the fact that the city remained basically cycle-unfriendly, with little space for bikes, high traffic volumes and speeds, a lack of infrastructure, compared with the conspicuously cycle-friendly north European cities, and a preponderance of one-way streets from which cycles were generally not excepted, thus making for round-about journeys. At that time, Paris seemed to have pulled significantly ahead of pre-Borisbike London in cycling terms. Visiting Paris, albeit briefly, again now, my subjective opinion was that cycling in Paris has not advanced over the last few years. It seems to have flatlined. The fashion for the rubber studs seems to have gone and some or all of these semi-segregated tracks have been removed. The have not been replaced with anything better, and nothing substantially new has been introduced to improve the attractiveness of cycling. In other words, the gains that accompanied the introduction of the velos have not been sustained because there has not been an aggressive programme of continual improvement of the cycling environment. The gains from the hire scheme have run their course. This is undoubtedly what we will see in London without a significant change of policy from TfL and the government (which looks unlikely). With the current failure to invest in serious improvements to the cycle environment and infrastructure, symbolised by the senseless Cycle Superhighway concept and the even more senseless Biking Boroughs, coupled with Boris’s dual mad ideas of “treating all modes equally” and “smoothing the flow”, which both amount to de-prioritising walking and cycling, we will see, at most, another year of increasing cycle use, with the introduction of casual usage of the Boris Bikes, and then we will see cycling in London flatline at below a 2% modal share. London needs to learn from places where cycling and walking policy is working, such as Copenhagen, Münster and Geneva, not from places where it is not, such as Paris and New York, easier though it may be to relate, conceptually, these cities to London. 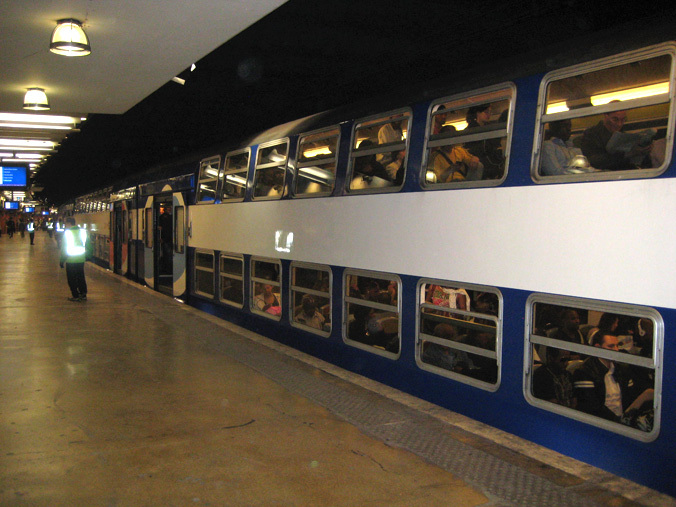 On the public transport front, Paris clearly leads London. They have had the investment over the long term that London has not. 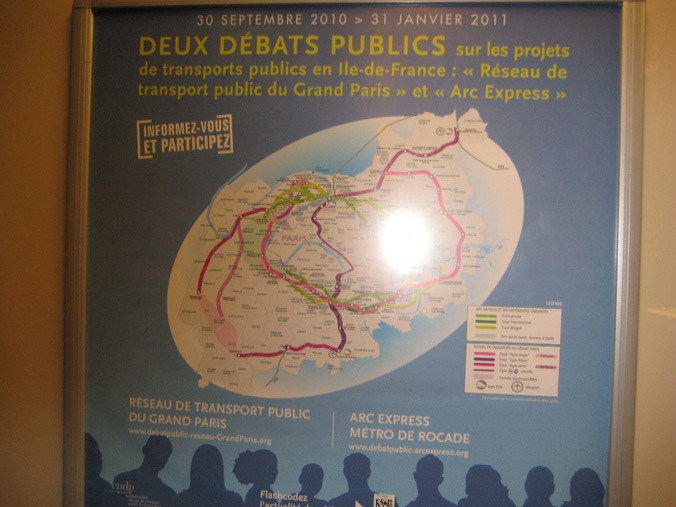 I saw from this poster in the RER (urban and suburban rapid transit trains) that they are now having a public debate on new orbital suburban rail lines for the Paris region. Orbital suburban rail is the most yawning gap in London's transport network, particularly north of the Thames. The last orbital rail lines to be built in central and North London were the Circle Line of the Underground, and the North London Line (now branded as part of the London Overground), both completed before 1910. Obviously, London has expanded hugely since 1910, and both these orbital lines are now much too far inside the metropolis to be considered "suburban" links. Bizarrely, the rail network of North London has in fact not changed significantly since the suburban Underground lines were completed, before 1940. Since then, the outer London suburbs have been excellently connected to the centre, but disconnected from each other, the only public transport between them being the buses. The excellent London branch of the Campaign for Better Transport (the charity previously known as "Transport 2000") has come up with a well thought-through idea for a North and West London Light Railway, but neither TfL nor the DfT has shown much interest in it, which is sad. The failure to create serious public transport infrastructure in the outer London suburbs serving modern needs, which are as often for orbital journeys as radial ones, particularly north of the Thames (south Londoners at least have the London Tramlink) is a significant contributory factor to London's environment falling behind that of its peer cities in Europe. While the massively expensive Crossrail project trundles on, to be completed – when? – I haven't the slightest idea, London's first attempt at the concept of putting full-size trains underground for a long distance (and it only essentially duplicates the Central Line of the Underground with more capacity), Paris has had lines A and B of the RER since 1977, and line E, the fifth line, was opened in 1999. As one speeds through northern France, towards the tunnel, the flat landscape is dominated by electricity pylons: a transmission grid probably taking part of France's nuclear-generated electricity to England; since Mrs Thatcher's privatisation of our electricity supply, the French state company EDF (Electricité de France) seems to have taken over a large share of our supply. As one emerges from the tunnel in Kent, the landscape is dominated by huge multi-layered barricades of steel fencing around the tracks, built to keep illegal immigrants out. France – a nation of transmission; England – a nation of barricades.